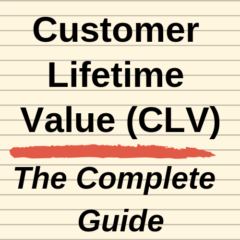 When calculating customer lifetime value (CLV), one of the key inputs is the number of years that the average customer will purchase from the firm. This is surprisingly easy to calculate if you know the loyalty/retention rate of customers. The formula for average lifetime period of customers is simply 1/(1-retention rate). You should know that the opposite to the retention (or loyalty) rate is called the churn rate – which is the percentage of customers that are lost in the time period. For example, an 80% loyalty/retention rate means that 20% of customers are lost (churned). And a 60% loyalty/retention rate means that 40% of customers are lost/churned. In all cases, the retention and the churn rate should add up to 100% to account for all the customers. Hopefully what you should notice, is when we convert the churn rate to a simple fraction – where we have 1 as the numerator (top number), we can simply take the bottom number (the denominator) as the number of years. This occurs because, as we divide the fraction into one, the calculation has the impact of inverting the fraction. Therefore, if you remember your approach to dividing fractions, you should be able to work out the average lifetime period for any fraction – by inverting the fraction. And you may recall from mathematics, that to divide a fraction you turn it over and multiply it. Because we are dividing into one, we end up multiplying by one – so all we have to do is invert the fraction. For example, if we have a 30% churn rate, as a fraction that is 3/10. When we invert that we get 10/3 – which is equivalent to 3.33 years. Likewise, if we have a 40% churn rate, that is equivalent to 2/5 – we then invert it and get 5/2, which is equal to 2.5 years. Next Next post: Customer lifetime value – does the average lifetime period make sense?